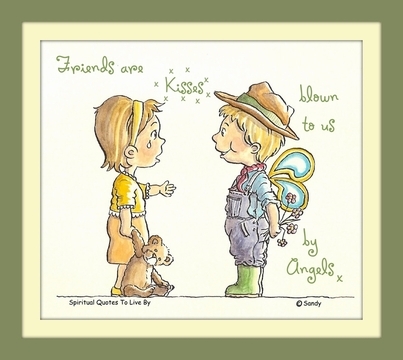 These positive and inspirational friendship sayings are all words of love and wisdom that are from unknown sources. 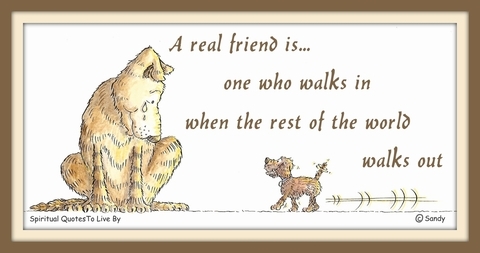 For quotes from known people take a look at the Friendship Quotes page. The illustrations on this page are by my wonderful friend Sandra Reeves. Sandra is a friend that is always there for me (and many other people) should I need her help in any way. She is a shining example of a true friend. A friend is kind and caring and they often think of you, they can seem to cheer you up with just a word or two. A friend is one who knows you as you are, understands where you've been, accepts who you've become and still invites you to grow. A friend is someone who can make you smile no matter what, and with endless generosity they give you such a lot. A friend is someone who knows the song in your heart, and can sing it back to you, when you have forgotten the words. A special friend at Christmas is the present we all need. A gift no one should be without, a priceless thing indeed. A strong friendship doesn't always need daily conversation or togetherness, as long as the relationship lives in the heart, true friends will never part. A true friend is someone who thinks you are a good egg... even though they know you are slightly cracked. Anyone who looks for a friend without faults, will be without friends. Count your life by smiles not tears. For many people.. it's our siblings that are our first and oldest friends. Friends are like stars... you may not always see them, but you know they are there. Sometimes they hold you up. But, sometimes it's enough to know they're standing by. Friendship isn't a big thing... It's a million little things. Friendship... The only cement that will hold the world together. I like me when I am with you. If friendship were a colour, you would be a rainbow to me. If the light that shines on you seems to darken by the day, remember that a friend of yours is never far away. If two hearts are meant to be friends... No matter how long it takes, how far they go, how tough it seems, fate will bring them together to share friendship forever. If you appreciate someone... Let them know. If you make friends with yourself.. you will never be alone. If you're alone... I'll be your shadow. If you want to cry... I'll be your shoulder. If you want a hug... I'll be your pillow. If you need to be happy... I'll be your smile. But anytime you need a friend... I'll just be me. It can lift our hearts when someone takes the time to say that warm and special caring thoughts are being sent our way, it brings a touch of happiness and sunshine to our day. My girl friends are the sisters I picked out for myself. And always stand by you. On the canvas of life we often go off colour, but as long as there are special people to add the right shades... Life goes on to be a rainbow. People don't always need advice. Sometimes all they really need is a hand to hold, an ear to listen, and a heart to understand them. Some people come into our lives and quickly go. Some stay for a while and leave footprints in our hearts, and we are never ever the same. Some people in our lives are of the extra special kind, they brighten up our days and leave such happiness behind. Sometimes, the only therapy we will ever need in life is... a friend who listens. Sorrows shared with a good friend become much more bearable. The best antique is... an old friend. The friendship of a child is the brightest gem, set upon the circlet of society. The highest privilege there is, is the privilege of being allowed to share another's pain. You talk about your pleasures to your acquaintances, you talk about your troubles to your friends. 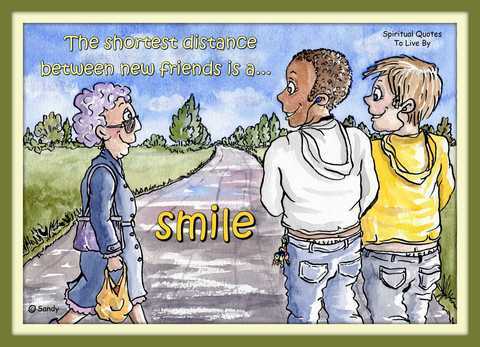 The shortest distance between new friends is... a smile. The special gift of friendship should be treasured every day, it's something very precious and should always be that way. Though miles may lie between us, we're never far apart. For friendship doesn't count the miles, it's measured by the heart. To make a difference in someone's life, you don't have to be brilliant, rich, beautiful or perfect. You just have to care enough and be there. Treat your friends like you do your best pictures... Place them in the best light. When everything is wonderful, or things don't go as planned, it's always good to know, that a friend is close at hand.